You have the power to uplift and bring positive change to our world. You can bring healing change to your personal life, your communities and your world. You can do it. We can do it. That is part of your destiny. Are you ready and willing to make a quiet choice to bring positive change? A quiet choice is an inner dedication, an awakening, a realization and a decision, to shift your attention, focus and energy to a higher place. When you make that quiet choice, your whole field and being aligns to that choice. 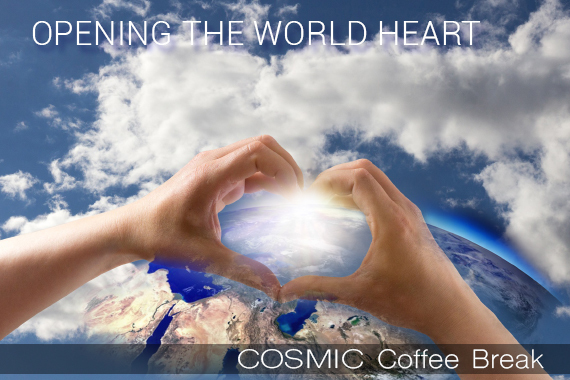 In this episode of the Cosmic Coffee Break, Opening The World’s Heart part 1, Lumari shares more about the wisdom teachings of quiet choices. She also guides you in a very powerful and saturated meditation, Opening the World’s Heart, to help you and all of us move into a greater experience of open-hearted living. Please move the energies forward into your heart, so our future can be filled with blessing, community and relatedness for all. And please share this meditation. You will be delighted and moved with how this meditation can shift your life and our world.